The Bureau of Labor Statistics projects an 18% growth in healthcare occupations by 2026. Healthcare also offers some of the highest paying occupations -- health services managers earned a median salary of $98,350 in 2017. There is a high demand for skilled health services workers, and earning a health services administration associate degree online increases your chances of obtaining one of these rewarding careers. Whether you want to work directly with patients or provide support services behind-the-scenes, the health services field offers diverse opportunities for a range of interests and personalities. Entry-level positions in health services are available in hospitals and clinics, human service agencies, pharmacies, and rehabilitation centers. A health and human services associate degree gives you the opportunity to explore your interests while gaining the necessary skills and knowledge to pursue further educational paths and high-paying careers. George Washington University, a private research university established in 1821, enrolls over 27,000 students in a variety of undergraduate, graduate, and professional degree programs. For students interested in health services careers, the school offers an online Associate of Science in Health Sciences in Lab Technology degree program. The online program is designed to meet the needs of working military professionals in the Army and Navy medical lab technicians seeking to increase their education and qualifications in the field and earn promotion. The program requires 75 credit hours for completion, with 60 hours devoted to specific area of study. Coursework for the program covers fundamental topics, including written and oral communication, current issues in the field and healthcare literature, healthcare policy, and biology. George Washington University is accredited by the Middle States Commission on Higher Education (MSCHE). Excelsior College, a private, non-profit university established in 1971, enrolls over 34,000 students in undergraduate and graduate programs. Among its many offerings is an online associate in health sciencesdegree program that provides students with a path toward starting a variety of health services careers. The online associate in health sciences degree program requires 60 credit hours for completion, with 30 credits in the specific area of study. The program develops key knowledge and skills in students, including oral and written communication, applying critical thinking, understanding the structure of the healthcare system and current trends, understanding the various roles of healthcare professionals. Coursework for the program includes a blend of core coursework with health sciences specific coursework in areas such as medical terminology, the history of the field in the US, healthcare professionalism, and a capstone. Excelsior College is accredited by the Middle States Commission on Higher Education (MSCHE). St. Petersburg College, a public, state college established in 1927, enrolls over 29,000 students in undergraduate programs, including an online Associate of Science in Health Sciences degree program. The program consists of 60 credit hours, and provides students with plenty of flexibility through 10 focus options, including: dental hygiene, emergency medical services, general health sciences, health information technology, nursing, orthotics and prosthetics, physical therapist assistant, radiography respiratory care, and veterinary technology. Regardless of the path chosen, students develop key knowledge and skills in health services, including a foundational knowledge of health care delivery and language, a basic understanding of administrative functions and requirements, legal compliance, and implementing strategies. Credits and coursework from the program may transfer into the college’s related Bachelor of Applied Sciences in Health Services Administration. St. Petersburg College is accredited by the Southern Association of Colleges and Schools Commission on Colleges (SACSCOC). Part of the Kentucky Community and Technical College System, Madisonville Community College was recently the only two-year college in the country to simultaneously hold two Title III grants from the U.S. Department of Education. Founded in 1968, MCC quickly developed a reputation for offering comprehensive, affordable associate degrees in a variety of majors. MCC’s 64-credit online associate degree in human services takes a hands-on approach to the discipline. In addition to 30 hours of general education coursework, students pursuing the human services degree complete a series of required technical classes that impart foundational skills and techniques. Lectures present a broad survey of major theories and common practices in counseling, psychology, and the social sciences, which learners subsequently apply during a four-credit field experience in a clinical setting. While the school delivers all its courses in a self-paced format through Blackboard, some courses may require students to complete proctored exams at an approved location. Online learners receive full access to academic advising resources and MCC’s digital library. Kentucky residents and out-of-state students pay the same per-credit fee, and online students are eligible to apply for numerous scholarships. Prospective students must submit official high school or college transcripts, or GED scores, along with an application. Applicants who do not meet the minimum ACT score requirements must complete the online TABE/KYOTE assessment for appropriate course placement prior to starting classes. The school evaluates transfer credits on a case-by-case basis, and students may apply up to 24 credits toward their MCC degree. MCC is regionally accredited by the Southern Association of Colleges and Schools Commission on Colleges (SACSCOC). This North Dakota institution takes pride in remaining at the forefront of technological advancement. Best known for its sustainable energy programs, BSC specializes in offering innovative, workforce-relevant degrees that address emerging technologies and ideas. Along with four-year liberal arts degrees and technical certificates, the college offers two-year programs in a variety of fields, including digital audio production, phlebotomy, and human services. Consisting of 60 credit hours, BSC’s career-focused online human services associate degree builds the skills needed to take on entry-level positions in the field. Courses build familiarity with the issues and assistance programs human services professionals encounter most frequently, including Medicaid, nutritional assistance, and substance abuse. Elective options include courses on gerontology, juvenile delinquency, and abnormal and developmental psychology. The program culminates in an internship, during which learners work alongside a local human services provider of their choosing. Applicants must provide official high school transcripts, GED scores, or college transcripts. Like other schools in the North Dakota University System, BSC requires all prospective students to complete a placement exam. While applicants may take the Accuplacer exam offered through the college, BSC also accepts ACT or SAT scores from within the last five years. Per-credit tuition varies according to the student’s state of residence, as well as course subject and level. Approximately 75% of learners who apply for one of BSC’s many institutional scholarships receive an award. BSC is regionally accredited by the Higher Learning Commission (HLC). The first community college in the state, Northwest Iowa Community College also claims status as Iowa’s smallest and most rural community college. In 1994, NCC began offering web-based dual enrollment programs to students at rural high schools throughout the region. Today, online learners can choose between more than 750 courses and several degrees, including nine pre-professional transfer programs. Students enrolled in NCC’s human services associate degree online can transfer to a four-year institution upon graduation. The 60-credit curriculum includes 45 hours of general education coursework and 15 elective hours from any field. Five major courses introduce fundamental concepts related to family dynamics, juvenile delinquency, and substance abuse. In addition, all human services degree candidates must complete a college experience course, regardless of their major. Online programs follow the same term-based schedule as their on-campus counterparts, and the school delivers its coursework in a synchronous format with weekly deadlines. NCC requires online students to attend on-campus classes one day per week, and learners must maintain a cumulative GPA of 2.0 or better to graduate. After acceptance, all prospective students must speak with an adviser prior to enrollment to create a degree plan that meets their needs. Online learners receive full access to on-campus resources, including tutoring services, library materials, and the NCC bookstore. NCC is accredited by the Higher Learning Commission (HLC). See more of the Best Online Associate in Human Services Degree Programs. Located about 50 miles northwest of Wichita, Kansas, Hutchinson Community College is a two-year school offering more than 70 associate degrees. Distance learners at HCC can pursue a health information technology associate degree online. The 66-credit AAS in health information management prepares students to manage essential information and records in the healthcare industry. Learners take courses that include health records applications, healthcare analytics, medical terminology, and a coding lab. Upon graduation, students can take the national exam for registered health information technicians (RHITs) from the American Health Information Management Association (AHIMA). HCC’s department of online education provides a variety of support services to distance learners, including technical assistance, proctoring information for exams, and library resources. Online learners also qualify for financial aid opportunities, including scholarships and grants for both full-time and part-time students. HCC awards more than 500 scholarships each year. Applicants to HCC must meet minimum reading competency standards, as well as minimum math and/or English standards for specific courses. Prospective students who submit ACT or SAT scores may not to be required to take the school’s placement tests. Hutchinson Community College is regionally accredited by the Higher Learning Commission (HLC). The health information management program is fully accredited by the Commission on the Accreditation for Health Informatics and Information Management Education (CAHIIM). The Boeing Corporation helped found Shoreline Community College, located just north of Seattle, Washington, in 1964. Today, SCC offers more than 100 academic and technical programs, including many online options. Students pursuing SCC’s health information technology degree online learn how to professionally collect and manage health information records. Graduates can find work as health information technicians, coding specialists, health information managers, medical record supervisors, and medical record technicians. Work environments include hospitals, insurance companies, nursing homes, and home health agencies. The curriculum for this degree has no in-person requirements and can be completed entirely online. The 92–94-quarter-credit curriculum of this associate in applied arts and science in health information technology requires students to meet with a faculty adviser to create an academic plan at the beginning of the program. Health information technology majors take required coursework that covers human diseases, intermediate medical coding, and medical terminology. To be eligible for admission, individuals also need to demonstrate strong English grammar skills. Applicants must also complete prerequisites coursework in intermediate algebra, English composition, human biology, and computer literacy before enrolling. Finally, students need to submit a government agency and criminal background check to complete the program’s clinical practicum and work in a healthcare environment. Shoreline Community College is regionally accredited by the Northwest Commission on Colleges and Universities (NWCCU). The online AAAS in health information technology program is fully accredited by the Commission on Accreditation of Health Informatics and Information Management Education (CAHIIM). Founded in 1865 to educate returning Civil War veterans, Peirce College is a private school in Philadelphia, Pennsylvania. Today, the college offers practical undergraduate degrees in business, information technology, paralegal studies, general studies, and healthcare. Prospective students interested in one of the best health information technology online degree programs can pursue an AS in health information technology at Peirce. This program provides technical training in healthcare, business, and IT to help students begin or advance their healthcare careers. The flexible associate of science program is available fully online or as a hybrid option. Students must complete 64 credits to graduate. Available courses include application software fundamentals, legal issues in health information management, CPT outpatient coding, and statistical applications in healthcare. All online learners also complete a three-credit professional practice experience at the end of the program, helping them build practical skills and develop professional connections. Graduates can find work as medical assistants, insurance and claims specialists, and staff members at hospital facilities. Individuals who want to keep exploring the field can continue their education in Peirce’s bachelor’s in health information administration program. To further increase their employability, some students also pursue AHIMA certifications after they graduate. Peirce College is regionally accredited by the Middle States Commission on Higher Education (MSCHE). The AS in health information technology program is fully accredited by the Commission on Accreditation for Health Informatics and Information Management Education (CAHIIM). 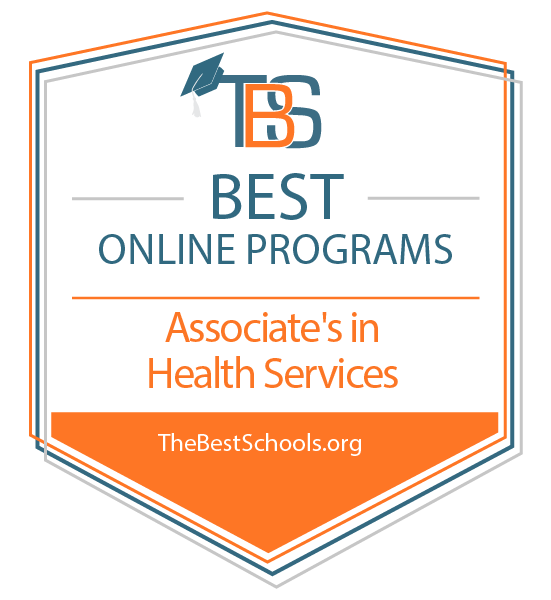 See more of the Best Online Associate in Health Information Technology Degree Programs. Florida Institute of Technology (widely known as "Florida Tech") is a private research university with five academic divisions with a strong emphasis on science and mathematics. Located on 130 acres in east-central Florida, the institute's main campus is in the heart of Florida's “Space Coast.” Melbourne, situated beside both the Indian River and the Atlantic Ocean, is about an hour's drive south of the Kennedy Space Center and about 90 minutes east of Disney World. Founded as Brevard Engineering College in 1958, Florida Tech has a nearly 5,000-member on-campus student body. The school has strong ties to the nation's space program. Alumni include a former NASA director and five Space Shuttle astronauts. You can earn an online associate's degree in healthcare management from Florida Tech in less than 20 months. The Associate of Arts in Healthcare Management includes instruction in the areas of healthcare organizations, managed care, and medical ethics, and also offers a strong business foundation. You can also apply your AA degree to earning a Bachelor of Arts in Business Administration-Healthcare Management. Florida Tech University Online classes include chat rooms, streaming video, discussion boards, and a messaging system. Florida Tech received regional accreditation from the Commission on Colleges of the Southern Association of Colleges and Schools. When you include its huge online student body, Liberty University is the largest private, nonprofit university in the nation and the largest Christian university in the world. The university offers some 350 programs to about 15,000 students on its 7,000-acre campus in the beautiful Blue Ridge Mountains of Virginia, and more than 90,000 students online. The university's highly successful online program, called Liberty University Online, features interactive online discussions between students and instructors and limits class sizes to 25 students. All associate's degrees are available completely online. Sixty-one credit hours are required for your associate's degree. Liberty University Online's Associate of Arts in Medical Office Assistance program helps prepare students for a career as a medical office assistant in public health departments, hospitals, and clinics. Last year, more than 6,500 online students walked across the commencement stage at Liberty University (Jerry Falwell founded the university as Lynchburg Baptist College in 1971) to receive their diplomas. Liberty University received accreditation from the Southern Association of Colleges and Schools Commission. Founded in 1914 as the Denver Bible Institute, Colorado Christian University (CCU) is a private evangelical and interdenominational institution. All courses are taught with a Christian worldview, so with your online healthcare administration associate's degree, you will gain experience in and insight into the ethics and leadership opportunities of the healthcare management profession. The online Health Care Administration program requires 60 credit hours. Students can complete the program in less than two years. Students can apply an online associate's degree in healthcare management from CCU to a Bachelor of Science in Healthcare Administration degree. Colorado Christian University received regional accreditation from the Higher Learning Commission of the North Central Association of Colleges and Schools. See more of the Best Online Associate in Healthcare Administration Degree Programs. See more of the Best Online Associate in Healthcare Management Degree Programs. Founded in 1977, Keiser University originated as a career-centered higher learning institution for working students in Florida. Keiser remains the third-largest nonprofit university in the state. The university enrolls nearly 20,000 students across 18 Florida campuses. Keiser offers more than 100 areas of study, including online options. Keiser’s online medical assistant program trains students in the clinical and administrative tasks required from a professional medical assistant. Students learn how to take vital signs, review patient histories, conduct lab tests, and assist physicians during patient exams. Learners also gain administrative skills in scheduling appointments, preparing insurance claims, and maintaining patient records. The 60-credit online medical assistant degree requires courses in medical assistance, clinical education, and general education. Students must earn a “C” or higher in clinical lectures, clinical procedures, and lab procedures before beginning the mandatory externship in medical assisting. Graduates qualify for the registered medical assistant exam administered by American Medical Technologists. Online learners access courses through Blackboard. As a nationally recognized provider of career-focused academic programs, Keiser offers a variety of support services for distance learners, including resume preparation, mock job interviews, and career counseling. Applicants to the AS in medical assisting science need to submit a high school diploma or GED. Undergraduate applicants must contact an admissions adviser to determine any additional materials required for admission. Keiser University is regionally accredited by the Southern Association of Colleges and Schools Commission on Colleges (SACSCOC). Home to an inaugural graduating class of just 436 in 1968, SFCC now hosts an annual enrollment of more than 5,000 students, including over 2,000 distance learners. The college serves 14 counties through seven campuses and several education centers across Missouri. SFCC offers more than 40 programs, including two fully online degrees and more than 250 eLearning courses. SFCC’s online medical assistant associate degree prepares graduates for clinical and administrative tasks in a variety of ambulatory care environments. The associate of applied science in medical assisting includes 61.5 credits of general education courses and major classes. The hybrid program requires weekly on-campus labs in addition to online study. Students learn how to record medical information, take vital signs, prepare exam rooms, understand electronic medical records systems, coordinate appointments, and bill patients. The associate degree also helps students develop skills in active listening, reading comprehension, and communication. The program culminates in a clinical capstone experience. Students can access courses online through Blackboard. Learners completing the AAS degree online may choose from eight-week, 12-week, or 16-week classes. Distance learners should enroll full time. Applicants to the AAS in medical assisting must submit ACT or ACCUPLACER scores, hold a minimum GPA of 2.0, and take the test of essential academic skills (TEAS) pre-placement assessment. New students begin in the fall semester. The program accepts 25 students each year. Among Minnesota’s highest-ranking colleges for retention, graduation, and career placement rates, ATCC focuses on education for working adults. The school offers a variety of two-year degrees, transfer degrees, certificates, and professional programs that can be completed in just one year. ATCC provides more than 10 online programs in lucrative majors such as business, healthcare, and IT. Students pursuing the medical assistant degree online gain the technical and computer skills needed for administrative medical assistant positions. The 60-credit medical administrative specialist AAS encompasses four semesters of coursework in general education and major requirements. Students explore medical terminology, health information and medical records, technical writing, and healthcare systems and practices. The program culminates in a unique mentor-led capstone experience. The program stresses accuracy, confidentiality, and an advanced understanding of the technology commonly used in contemporary healthcare environments. All students complete an internship. Online learners access courses through D2L Brightspace. Students may begin the program in the fall, spring, or summer semesters. Support services for eLearners include virtual tutoring, writing assistance, study groups, and disability services. Applicants must possess a high school diploma. High school students may apply to ATCC as early as the 10th grade. These students can begin college-level courses through the college’s unique postsecondary enrollment options (PSEO) dual-credit program. Alexandria Technical and Community College is regionally accredited by the Higher Learning Commission (HLC). See more of the Best Online Associate in Medial Assisting Degree Programs. See more of the Best Online Associate in Medical Office Administration Degree Programs. The following programs are arranged alphabetically. With over 8,500 students, Georgia Military College provides a variety of undergraduate degree and non-degree programs in fields such as communications, mathematics, paralegal studies, and social work. Founded in 1879, the college continues to hold a central focus on military education. Georgia Military College offers an online Associate of Arts or Associate of Science in Social Work degree program designed to introduce students to the field. The program develops a foundation of knowledge in social work, including basic issues and concepts of the profession, as well as professional development skills. Students prepare to for a variety of positions, such as substance abuse counselor, case management aide, and social work assistant, as well as further study in a bachelor’s degree program. Georgia Military College is accredited by the Southern Association of Colleges and Schools Commission on Colleges (SACSCOC). Northampton Community College enrolls nearly 10,000 students in a variety of undergraduate degree and non-degree programs, including social work, education, computer science, and business. The college serves students through two local campuses, as well as an online platform. Northampton Community College offers an online Associate of Arts in Social Work degree program that provides students with a thorough introduction to the field. Students develop foundational knowledge and skills in social work through a curriculum that includes topics such as developmental psychology, diversity in social work, the history of the field, and sociology. Students prepare for future study in a bachelor’s degree program, and jobs such as social worker aide, clinical therapist aide, and case management aide. Northampton Community College is accredited by the Middle States Commission on Higher Education (MSCHE). Perimeter College at Georgia State University enrolls over 18,000 students in a wide variety of undergraduate degree and non-degree programs. Dedicated to student advancement and professional success, many of the programs at Perimeter College utilize a “pathway” approach that allow for an easy transition from associate’s to bachelor’s degree coursework. Perimeter College offers an online Associate of Science Social Work Pathway degree program designed to lead into the college’s online Bachelor of Social Work degree program. Students develop a strong foundation of key knowledge and skills in the field, studying professional social work practices, statistics, sociology, psychology, and anthropology. Students prepare for social work careers in settings such as clinics, hospitals, nursing homes, and government agencies. The online Bachelor’s in Social Work degree program at Georgia State University is accredited by the by the Council on Social Work Education (CSWE). Perimeter College at Georgia State University is accredited by the Southern Association of Colleges and Schools Commission on Colleges (SACSCOC). See more of the Best Online Associate in Social Work Degree Programs. Once you earn your associate degree in health services, transferring to a bachelor's program is a rewarding next step. Earning a bachelor's degree in the field opens up a plethora of rewarding new career paths and can lead to higher earning potential -- bachelor's health administration graduates earn an average of $36,110. By earning this degree, you gain necessary skills for administrative work in the healthcare field. Graduates pursue careers as medical administrative assistants or health services managers. They may specialize in medical recordkeeping, marketing, or operations. A bachelor's in social work leads to careers helping others overcome obstacles in their life. Graduates may earn licensure to work in clinical settings, and social workers with a bachelor's may specialize in macro social work and public policy. Health informatics is an interdisciplinary field leading to careers in information technology, electronic medical records, and network systems. Bachelor's graduates may choose from a number of professional credentials and specialize their degrees to fit their career goals. There are a variety of jobs available for those with an associates degree in health and human services. Opportunities in patient care include positions as medical assistants and technicians. If your interests lie in administrative or technical work, careers in transcription or medical records may be of interest. If you have a knack for problem-solving with clients, then a career in human services offers many fulfilling opportunities. Technicians work in healthcare settings to document patient information and medical history and ensure all information is current and accurate. Technicians often work with databases and electronic records and prepare insurance billing. Earning an advanced degree makes you eligible for professional credentials, leading to careers in health information management. Pharmacy technicians collect patient information, verify prescriptions, and assist with preparing and dispensing medication. They work in hospitals and pharmacies under the supervision of a pharmacist. Earning a degree in this field ensures you have the skills to work with patients, handle sensitive information, and prepares you for advanced training. Human service assistants work with clients to assess needs, help them complete paperwork, and coordinate care with other providers. These professionals demonstrate an understanding of social systems and develop skills in client care.